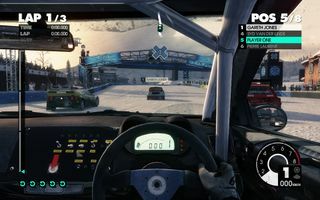 The game features full keyboard support but an Xbox 360 Controller is recommended. Owners of GFWL version on Steam get Complete Edition for free as a separate library entry. SecuROM PA and SecuROM 8 DRM. All non-Steam Windows versions require Games for Windows - LIVE DRM. [Note 1] SecuROM activation limit unknown. A revoke tool is available. Retail product keys activate on Steam. Mac App Store version does not support online multiplayer. Extract it to the installation folder and replace the existing files. 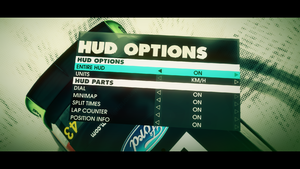 Unlike Colin McRae: DiRT 2, Rapture3D is not included by default. Download Rapture3D "Game" Edition from Blue Ripple Sound. Install it and launch the speaker layout configuration tool at the end. Select a Layout according to your setup (Headphone Stero (Compat.) for 3D sound on headphones). If necessary, go to Decoder and change the Method according to your ears. Change software to rapture3D, and save the file. If you have a custom HRTF file for OpenAL Soft, it might be better to use .zip\bin\Win32\soft_oal.dll from that tool and rename it to <path-to-game>\OpenAL32.dll because Rapture3D Game has only six predefined HRFT methods and will not allow raw ".mhr" files. However, entering a multiplayer lobby will crash the game. Some other non user-specific configuration files are stored with the game data. See the Field of view (FOV) section for more information. Saves are not compatible between the Steam and Games for Windows - LIVE versions. 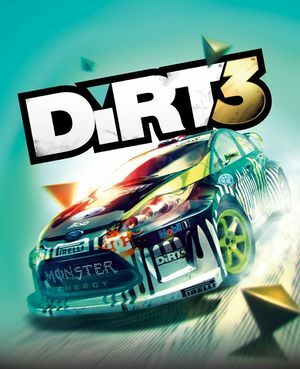 Replay data is stored in %PROGRAMDATA%\Codemasters\DiRT3\. Toggle with Alt+↵ Enter. Window is fully resizable. 2x-8x MSAA, 8x-16x CSAA, and 8x QCSAA. The parameters concerning the field of view as well as the point of view of each of the in-game cameras are stored in a binary file named cameras.xml. There is one such file for each car in the game. They are located with other car-related data in the subfolders of: <path-to-game>\cars\models. 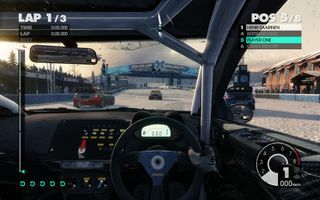 These files can be batch edited using Dirt3FovChange although DLC cars may prove problematic as their data is reportedly stored in a different location. Conveniently, a backup of the binary files will be made in text format before attempting to modify them. This allows a quick restore of the most recent state. This method is reliable and stable: modifications can be made on-the-fly, while in a race. Extract the files from the archive into a common folder. Launch Dirt3FovChange.exe. Although an essential part of the process, binXml.exe won't require user input. Set the desired values and click the start button. Launch the game. Test the settings in a race. Exit the race. Alt+Tab ↹ to Dirt3FovChange. Restore the original settings. This will not erase the values you previously entered in the GUI. Tweak said values. 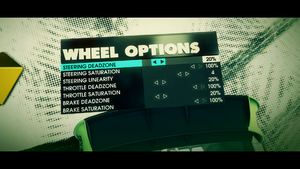 In DiRT3, start a new race to check your changes. Repeat until the desired effect is attained. Backing up the files that are about to be modified is never a bad idea. 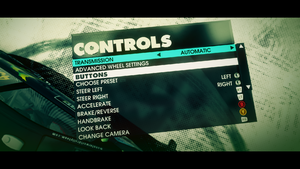 In some cases, you may have to manually point Dirt3FovChange to the DiRT 3 installation folder. It is advisable to restore the original files inbetween modifications. This way, the default settings will always be accessible. Vertical FOV: a larger number will translate into a wider field of view. 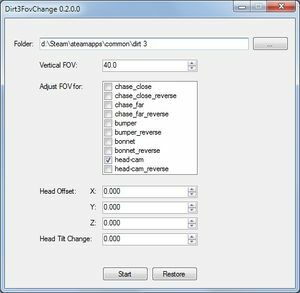 Adjust FOV for: selects the in-game camera or cameras you want to edit. Head Offset: affects the position of the head-cam (cockpit view). A modification of 0.1 will yield a noticeable change. It is to be noted that the point of view can be placed outside of the car. X: affects the lateral position. A positive value will move the point of view to the left. Y: affects the vertical position. A positive value will move the point of view upward. Z: affects the front/back position. A positive value will move the point of view closer to the dashboard. Head Tilt Change: affects the vertical angle of the camera. Compared to the position values, the tilt value works on a different scale: a modification of 1 will yield a barely noticeable change. A positive value will tilt the camera up. Default FOV, default head position. Custom FOV of 65, default head position. False for DirectInput. Buttons have to be rebound in settings and controller can only be used in game, not in menus. Fully remappable. Combined with keyboard rebinding. Mouse cursor is always on the screen. 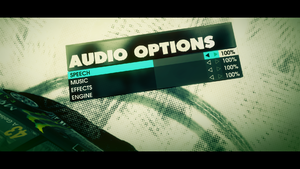 Speech, Music, Effects and Engine. Support for 5.1 and 7.1. The Games for Windows - LIVE version requires a Microsoft account for online play (optional for offline play). The Mac App Store version does not support online multiplayer. VSR is supported if your native resolution is FHD or QHD. 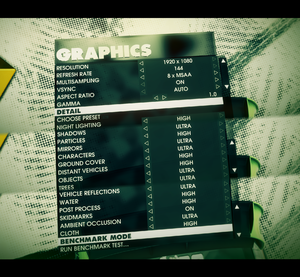 Dirt 3 may achieve noticeable FPS boost then. Game is generally not very demanding. Change false to true, and save the file. OpenAL Rapture3D can be installed and used optionally. The game is optimised for AMD/ATI graphics cards. ↑ Games for Windows - LIVE DRM features: SSA activation, supports local profiles. ↑ 2.0 2.1 File/folder structure within this directory reflects the path(s) listed for Windows and/or Steam game data (use Wine regedit to access Windows registry paths). Games with Steam Cloud support may store data in ~/.steam/steam/userdata/<user-id>/44320/ in addition to or instead of this directory. The app ID (44320) may differ in some cases. Treat backslashes as forward slashes. See the glossary page for details. This page was last edited on 9 November 2018, at 23:18.